viagra canadian pharmacy order Have you ever attended a sporting event, a concert, or the theater and wished you were sitting in better seats — down front close to really see the action? I have, and I’ll bet you have, too. order now Walking the trail around Kumeyaay Lake I notice things, I take in the details. One such detail is a tree branch sticking up from the bottom of the lake with an elongated “V” shaped fork at the top. I have no idea how long this branch has been there, but I am certain it is years. And for many years, I have watched various species of bird compete for that tiny square inch of space, the perfect perch, the best seat in the house; you can see everything from here! buy now Do you suppose the law of the jungle determines a pecking order, a priority seating arrangement? How does the wild kingdom decide who gets to sit there? Is there anyone really tasked with governing that perch? Maybe I am over thinking it. Perhaps it’s as simple as this: if the spot is open, it’s yours, go for it! My reason for even pondering such a question is the variety of birds that occupy the seat. Size, thus physical dominance, is not the deciding criteria. I have witnessed a variety of birds fight for control of feeding territory and size rules that battle, but this stick in the lake seems different. 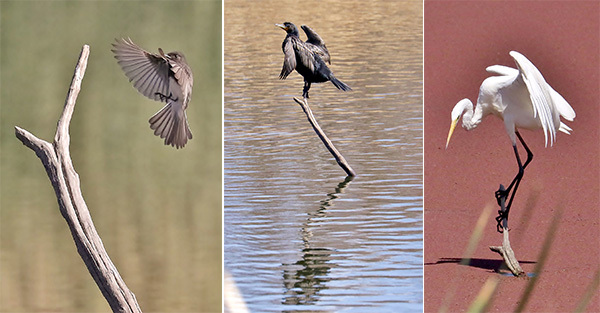 Among the many varieties spotted roosting on the perch, I have seen a tiny black phoebe (Sayornis nigricans), a sleepy-eyed black-crowned night heron (Nycticorax nycticorax), a couple of double-crested cormorants (Phalacrocorax auritus), and a great egret (Ardea alba). Even more curious, once in possession of the coveted spot, what do you do with it? The phoebe, being a nervous sort anyway, is very busy flitting out and back, collecting insects off the surface of the lake. The night heron must have had a hard day’s night. I saw it at dawn and the heron was hardly able to peek through slitting eyelids to confirm my presence. The cormorants and great egret however used the prime location to just take in the view as they sat and sat and sat, preened and sat, seemingly in no hurry or care to be anywhere. After all, if you have the best seat in the house, what else do you do? —David D. Cooksy is a trail guide at Mission Trails Regional Park.